Paul Burgess probably holds the world record for number of SUP boards owned. He is pretty obsessed with stand up paddling, the design of the boards and the performance. This all makes him an excellent reviewer for SUPGlobal as he know what he is talking about. 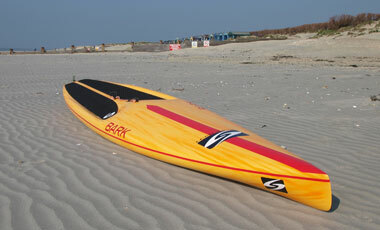 Recently he purchased a 14ft Surftech Bark Dominator and has reviewed it for us. I think this is probably the most comprehensive review you will be able to find for this board. By Paul W. Burgess: Although the 14 ft Surftech Bark Dominator has been available in the USA and elsewhere for some time, and is well established as a dominant model in racing there, they have only recently arrived in the UK. In fact, I bought the first one. When making my choice to buy this board, I had considered many possibilities. But despite –or perhaps because of – the prevalence of this board in other countries, I couldn’t find that much online about the board. I’m going to try to fill that gap now, so that if you are thinking of buying one, you’ll be better placed than I was to make a decision. I am an ordinary punter, with no links to any watersports company, I am not a sponsored rider, so I paid full price (although Simon at 2xs gave me a very competitive deal). It also means that this review is probably as unbiased an opinion as you are likely to find on the web. Surftech’s 14 ft Dominator was designed by Joe Bark, and looks and feels very much a bigger brother of the Surftech Bark Competitor 12-6, which itself is a much-admired board (see a “first impressions” review of the Bark Competitor 12-6 here: ). However, although the two boards look quite similar, they are really quite different in many ways. The 12-6 was designed as a “Battle of the Paddle”- type board, where short courses involving going in and out of the surf, and quick turns around buoys are the name of the game. But the thing you notice pretty immediately on jumping on the Dominator is that it isn’t really designed for quick turns. It is a race board designed to go very fast in straight lines. This is highlighted by the choice of standard fin. It is a 9″ design by Larry Allison, which looks like a cross between a Greenough 4a and a Wayne Rich #3. It is about 8.75″ tall, and has a very long base of about 8″ that fills pretty much the entire 10″ box when fitted. This wide base gives fantastic tracking. The fin has another immediate benefit: if in cross-winds you weight the rail opposite to the wind as you paddle on that side as well, you can make the board turns very nicely indeed into the wind, making it much easier to stay on course without extreme paddle manoeuvres. This is something to do with the design of this fin because if you lose some of this characteristic if you swap it for some others. But the downside of this standard fin is that it does make the board difficult to turn quickly e.g. round a buoy. However, you can make the board much easier to turn by swapping the standard fin for a shorter-based pivot-type fin, shoved right to the front of the box. So it’s no issue, and actually you can fine-tune this board well with different fins, which change its character quite a bit according to whether you want to emphasis stability, turning, tracking etc. There has been some discussion on web forums recently about the stability of the Dominator. Its width is quoted by Surftech as being 27 ½”, with a thickness of 7″. But it doesn’t feel as narrow or as tippy as those figures might suggest. The general opinion I had read was that the Dominator was marginally less stable than the Competitor (and the Competitor is one of the most stable 12-6 race boards currently available). This turned out to be about spot-on, in my opinion, once I bought the board. I am a reasonably experienced SUP paddler, but my balance skills are nothing special at all, and I am generally willing to sacrifice a bit of theoretical top speed for greater stability: most of my paddling is done in coastal waters, and I’m often out when it is very choppy indeed, and no-one else would bother. So the issue of stability worried me a lot before purchase. It needn’t have. However, this is not really a board for beginners. Although it is quite stable for a race board, it does feel as if it is intended for use as a relaxed long- distance coastal cruiser. It is designed to go fast, and unfortunately the things that make a board stable to stand on (e.g. width, weight etc) do not generally make for stability. But I am assuming that if you have got this far reading a review about a 14ft semi-carbon race board, then you are beyond the beginner stage, and are not as interested in stability on long cruises as you are the ability to go fast. If that is the case, you don’t need to worry about stability at all. As a test of the Dominator’s stability, I took it to a local spot which we call “the balance exam”. It is at the mouth of an estuary where strong currents (up to 6-7 knots) meet sandbanks and swell wrapping round a nearby island. When it is windy, and there is swell, at mid-tide it can get seriously hectic, with waves coming at you from all directions and rips tugging at your fin. It’s a pretty brutal test of SUP stability. I’ve taken the Dominator out there a few times now and have been surprised at how well it has coped. My conclusion is that primary stability is not that great, in common with many displacement nose race SUPs. But secondary stability is really pretty good, and if you are determined in your mind that you will stay upright, you generally will. To sum up, it isn’t a super-stable long distance cruiser, but then it isn’t intended to be. But it is stable enough for coastal runs in all but the foulest weather. If you have good balance and are experienced you shouldn’t have any problems. If you are a flat-water paddler in protected waters, then you should have no trouble at all in any conditions. I think ideally there would be two versions of this board: one slightly narrower perhaps for racing in dead flat and protected waters, and a version about 1″ wider for the coastal crew, where stability often determines speed more than does width. But Joe Bark has probably found the best overall compromise for the intended market in this board. The Dominator is light. I’m always a bit mistrustful of the weights quoted by manufacturers. I’m just like that – never believe anything unless I’ve witnessed it with my own eyes. So I weighed the board using my own scales. Now, this is not the most accurate measure, so these figures have to be considered approximate. But, weighed with the standard fin in place, and with a handle fitted, my board weighs exactly 13kg (28.6llbs). To put this in perspective, using the same method, I weighed my 12ft C4 Holoholo. This is a hybrid cruiser/surf SUP board of similar width, but in standard Boardworks TEC construction similar to many surf SUPS. The Holoholo weighed 13.8kgs. So in other words, the 14 ft Dominator is approximately 1kg lighter than a similarly narrow, but standard-type construction SUP which is 2 ft shorter. In fact, the Dominator is surprisingly light when you lift it – it is actually lighter than the standard construction 12- 6 Competitor I had, and I think about the same weight as advertised for the Jimmy Lewis Slice 12-6 displacement nose race board. So this is very good for a 14ft board. This lightness is reflected in performance on the water as well. Not necessarily in terms of top speed, but in terms of acceleration. It may also help upwind: the Dominator is truly fantastic upwind for such a big board, with a sharp displacement-style nose that really slices through oncoming chop. However, there is a downside. The Dominator is only available, I think, in “pro- elite” construction. This has a half-carbon bottom, which explains why it is so light. But as I have found, there is a price to be paid in durability. I am pretty careful with my equipment, but even within the first couple of weeks I had acquired indentations on the bottom of the board. One time I used a kayak rack on my car and hey presto, I was awarded two rack-shaped reminders of that trip for life. I won’t tell you what I shouted when I discovered those on my brand new board, but it wasn’t pretty. By contrast, I had carried the Surftech Competitor in Tufflite construction many times that way without even the hint of a mark – in fact after 6 months of regular use it still looked brand new. Since then I have somehow managed to acquire other small indentations on the Dominator as well, and there is a small area where the paint has chipped off. The top is stronger, but there too a minor stumble resulted in a trophy to my instability. Talking to other people with race boards, however, it seems that this is pretty much par for the course. Light race boards are not built for durability, in the same way as the durability of a Ferrari is unlikely to match that of a Toyota family runabout. Still, if this matters a great deal to you, and you tend to be a “bish-bosh it’ll come out in the wash” type who cares not a jot for your equipment, you may want to bear this in mind. I have no indication whatsoever that the Suftech Bark Dominator is any worse than any other board in its class in this respect. Just don’t put it down on any sharp stones. In fact you may want to carry a huge marshmallow with you to lay it down on when you get to the beach. No, don’t do that. I was only joking. You’ll attract the local dogs. Carry a lace-frilled satin cushion instead. This board is happiest as a flat-water speed machine. It is simply great in this role, and anyone who tries this board won’t be surprised at the race success it is having. I think the key phrase here would be “useable pace”: This is not some twitchy uber-difficult super-specialised confection that can only be managed by an elite racer whose day job is as a tightrope walker. There is something about it which encourages a good stoke rhythm even in the plodder. You can easily get fixated on watching the water break beautifully up the side of the sharp bow as the miles go by. It is also stable enough to not embarrass you on miscalculated strokes, and the tracking is excellent, so you can get more strokes per side before changing, meaning more strokes per minute, and greater average speed. In this way, it is a very flattering board. If you can’t be fast on flat water on this, you just aren’t fast. If that is you, then I’m sorry. Stop crying, leave the pies alone, and get some training in. Oh, and read Dave Kalama’s technique advice. That man has a gift for teaching. I’ve been surprised at how well this board can cope in this sort of role – which really is aimed at the 12-6 class. It is, as I’ve mentioned, startlingly good upwind, and the ability to check its track, if you have the skill, makes it useful in cross-chop. Pushing through waves is again surprisingly easy, and with the right fin and a bit of practice, turns aren’t difficult. It is also possible to surf the Dominator. Of course when I say “surf” in the context of a 14ft displacement nose race-board, I just mean catch a wave and head straight in, pretty much. Only a complete berk would try to properly surf a board like this. But in a BOP-style role where the aim is to get to the beach as fast as possible, then it works well. In fact I have had one of the longest rides I’ve ever had on this board, lasting way over a minute, on a tiny little 1ft clean wave. Lovely. It catches any breath of wave. You can also turn the board to a degree on the wave to avoid obstacles, although this would be probably easier if you are heavier (and/or more skilled) than I am (168 lbs). We do not get proper open ocean swells here, so I cannot comment at all on the board’s ability in serious downwind conditions. If you are likely to be using the Dominator for that purpose then please seek out an opinion of a DW specialist. What we do get here instead is short-period chop, with strong winds behind you, often at a cross-angle. In these conditions, the Dominator shows a weakness – perhaps its only one. I’m not a shaper, so I can’t tell you why this might be. Progress is still quite quick – you have to work hard to find a situation where this board isn’t. But it is not what you can call an enjoyable experience, unless your idea of fun is beating your naked man-parts with a thistle-bush. I think it might be something to do with the relative volume distribution in front vs. behind where you stand. It’s not the shape per se, because its little brother, the Competitor, is actually surprisingly decent downwind for a 12-6. And it’s easy enough to keep the nose up and it blasts through the wave in front nicely. And the Dominator can certainly catch and ride waves. But in short-period chop with the wind behind you, the Dominator feels quite skittish and unstable, and I have trouble getting it onto runners. I have no idea why. Maybe this is just me – I am not an experienced downwinder, and perhaps if you are taller, or heavier (or perhaps lighter and smaller) and/or a better paddler you might not have the same experience as me. But I doubt whether many people considering buying the Dominator are doing so with the intention of doing full-on downwinders. It’s a displacement-nose race-board, and good downwinders are a completely different design. How fast is it? Well, that depends on you of course. But I can give you a comparison with the Bark Competitor 12-6, which is probably a better way of telling it than saying “it is X mph faster…”, because this will depend on you and the conditions. There is a local course near us, which is a circumnavigation of an Island (Hayling Island), a roughly triangular course of approximately 13.5 miles. The waters round Hayling are heavily tidal, and there are many currents, local winds, and a few hazards to deal with. Last October 22 (2010) I finally managed to break the record for this course which was set by a local well- respected professional paddler, Steve West (you can read about his record attempts on his website, Island Paddler). He set a time for the course on a Starboard Pin of 2 hrs 43 mins. After much training, and several runs, I managed to beat this on the Surftech Bark Competitor 12-6 (standard construction) by 7 minutes, posting a time of 2:36. I had very good paddling conditions, with virtually no wind, and that time was at the peak of my distance paddling training, working pretty much as hard as I could. So I decided that that was about as fast I was going to go that year, sold the board, and concentrated surf SUPing over the winter (it gets cold and windy here during the winter making distance paddling hard). monitor (after all, it was only a training run…), but it felt at about 75-80% pace. Conditions were near identical to the previous October. And the time I posted was only 3 minutes slower than the record time I had set on the 12-6. Average speed on the Dominator was 5.0 mph, and the fastest speed over any one kilometre section of the whole circuit was 6 mins 28 secs (average speed 5.8 mph) – albeit with a little help from the tide. Now, I am not claiming this time is fast. It isn’t. I am just quoting this as a comparison with what I had done on the same course 5 months earlier when I was fitter and really trying hard, on a fast 12-6 race board. Bear in mind that I am an amateur of modest ability, in my late 40s, who only paddles for fun – I have never raced in my life. I also hadn’t distance paddled more than a few miles for 5 months. In fact, I can tell you how out of shape I was – I was wearing neoprene wetsuit gloves (it was still pretty cold), and I actually got blisters from the paddles on both hands through the neoprene! My hands had turned to cream puffs over the winter, always surf supping in head to toe neoprene (our water goes down to 4C). So, I was out of shape, and only out for a casual fun paddle. I could have gone a lot faster. So basically, the answer to how fast this board is this: On flat water, you will probably be about as fast on the Dominator when you are out of training and working at ¾ pace as you will be on a good 12-6 race board when you are at your fittest and going full bore. Given that the Dominator is only 18″ longer than the Competitor, which is itself one of the fastest 12-6 race boards in the world right now, that shows how well Joe Bark has managed to squeeze maximum speed out of 14 ft. It’s board on which it is easy to be speedy. The Dominator is probably the 14 ft flat water race-board to beat right now. It is hugely useable for a race-board, is light, and very fast. If you are looking for a downwinder board, or a casual, durable coastal cruiser, there are probably better boards for you. Instead, this is designed to allow intermediate and advanced paddlers to go very fast – and anyone who tries it with that in mind will instantly know why it is so popular. FAST. A virgin queen bee can mate with 15 drones in 8 seconds*. That’s fast. But not as fast as the Dominator**. Plenty stable in flat water. Great upwind, and decent in and out of surf. Great tracking with standard fin. Like many serious raceboards, it is fragile. Fast, but quite hard work in light downwinders. Could be more stable in choppy coastal conditions. *This is probably not true. ** This is true. All photos copright SUPGlobal.com, Photographer Simon Bassett.